According to the story, the famous industrialist, Gobinde Bhargav alias Vinda (BonamanIrani), the head of AB Group, and his son are unaware of killing people. A young man (Pawan Kalyan) calls him from Assam to meet the wife of Indraani (Khushboo) company, who is unconsciously claiming she has no heir. He joins the personal manager of the AB Group under the name of Balasubrahmanyam. The company searches for the victims and seeks for the victims of the murder. Who made those murders? Why did it What is the role of Seetharam (Adi Pinyshetty)? Is the child really good from Assam? Why did he come as 'anonymous'? How did Anubhikar Bhargava become a child of Subrahmanya? What is the relationship with the family of the widow? How is it: 'Anonymous' is a hundredth Pawan-Trivikram combo movie. There is no doubt in it. Corporate affairs, the dominant fight in which the story goes mainly around the moves, the piles and the like. Director has taken the themes of the legendary and legendary themes to guide the story. In the first scenes about the process of preparing a sitting chair, the story can be estimated by the protagonist. The family struggles for this fight, like a stupid story of love, and some entertainment scenes. Started up the story slowly by interacting with the interval, and putting a lot of nuances into the next day, the thriller made a thriller. The second half is how the child Subramaniam realizes how they are responsible for the killings. Interval pre-twist is impressive. Pawan's entry in the first half is impressive. Who killed the vandal and the downfall of his kingdom? The second half ran around. In this order the director showed the conditions faced by the protagonist. In addition, he tried to make comedy with the characters of Sharma (Murali Sharma) Varma (Rao Ramesh). Trivikram style comedy laughs for everyone. The scenes are impressive. In the climax he added to his mark and trivikram. Who made it: This is a story that is completely revolving around the hero. Pawan was impressed with his performance as Balasubrahmanyam, anointed as Bhargava. 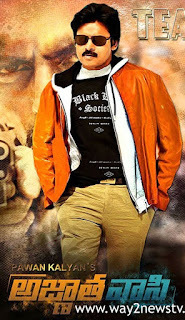 Pawan Mark appears in dialogues and action scenes. Many Gap Khushboo got another good roll. Her performance in Second Half, Climax is impressive. Muralisarma and Rao Ramesh are limited to comedy. Though heroines are not very popular, the beauty of the film is brought. Adi Pinysetti's performance is okay. It would have been better if the hero made the role of villain in the role of the character. If the character of the villain Seetharam is much stronger, the role of the anointed Bhargava will be elevated. The music director is Anantha Vasanthi, the first film in Telugu, is a grand launch. He gave good songs. The background score is good. Never mind. V. Manikandan camera performance is good. Pawan Kalyan Introduces Seen Film Highlights. The process of shooting scenes, particularly shooting scenes in Bulgaria, is good. Director Trivikram has once again showed his mark in dialogues. But the writer in Trivikram is more likely to be a mark than the director. In Sharma-Varma dialogues, Trivikram's style of comedy is more than a hundred. There is Depth in dialogs in the first way. Dialogues like 'Dharman' can be impressed with 'violence and violence.' But it would be nice to focus more on the story and stories.